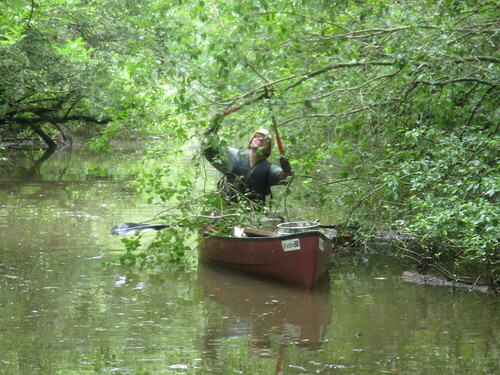 With the water high and a fun paddle coming up, everything was just right for a bit of pruning on Friday. It’s been a while since we’ve had an 11-hour work day. 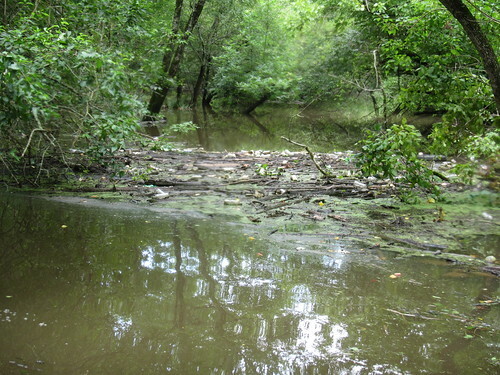 We’d checked the Bluebonnet gauge after all the rain, and we saw that the bayou was quite high. 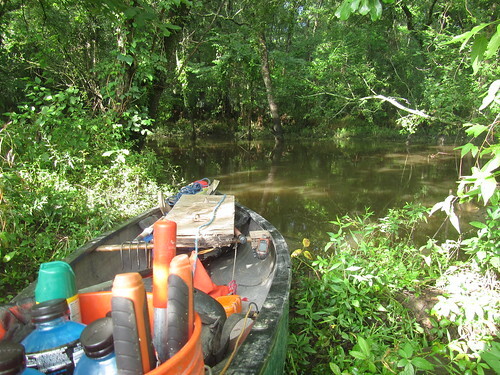 It had dropped down a couple feet from its most recent peak, but it was still high enough to require a portage at Rackley Bridge and to put you up in the branches in the “Car Wash” (the close-in mile-long section just beyond halfway to Manchac). That put it about as good a day as any for doing a bit of pruning to open up the way where branches have grown in over the last year or so. 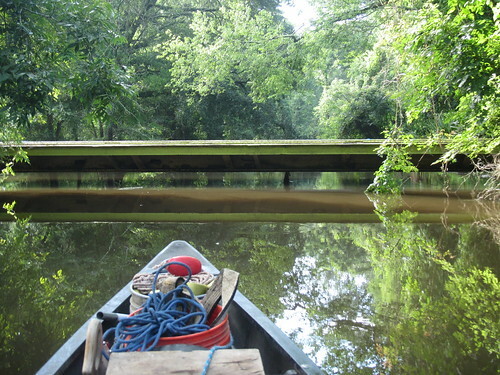 With the bayou so high, the launch was about as easy as it could be. There was no stepping down, and while it wasn’t quite high enough to launch from the grass (as has been possible a time or few), it was the closest it’s been in some time. We hit the water and started downstream, carried along by a significant current. 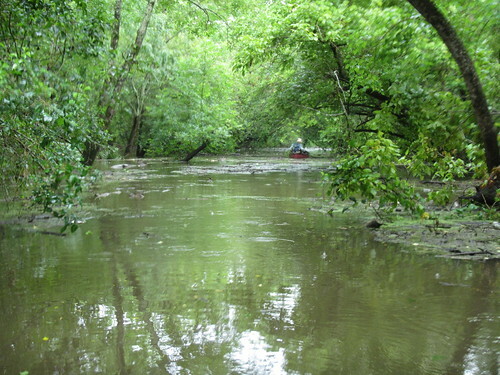 Paddling against it wouldn’t be too difficult, but it was certainly much more than a normal day on the bayou. We don’t often spend much, if any, time pruning, but over the course of a season or two, gradually the branches encroach again on the bayou. Without any pruning, the branches end up meeting in the middle and catching every log that comes by. Of course, even when you do only as much pruning as is actually necessary, dismantling the pieces so they don’t catch and cause more problems greatly multiplies the amount of work involved. It was a long, long day. There were also a few long logs to dispatch and one good old fashioned jam to clear out, but compared to the pruning work, the rest seemed almost trivial. I must say that I was pleasantly surprised how little (non-pruning) work there was, even with all the rain and high water. 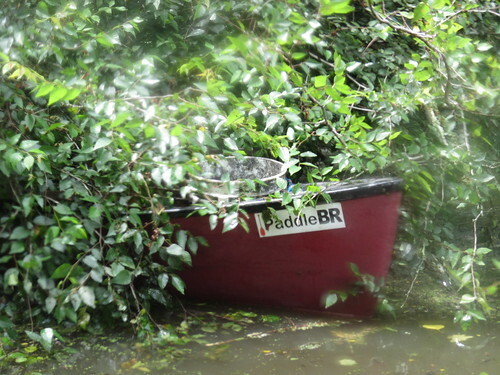 There are a few places with significant portions of long-downed trees that could also use a bit of clean up, but the paddle trail’s been holding up quite well even with all the rain this summer. 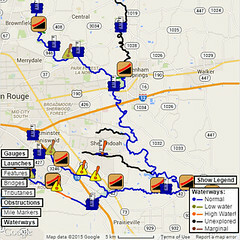 After 8-1/2 hours of work heading downstream, we hit Bayou Manchac and turned back toward the park. Fighting the high current in the bottom 3/4 mile or so was slow going, but the low-banked middle zone was as calm as it always is during high water. Eleven hours after we left the park, we arrived back, safe and sound (if a bit worn). The paddle trail was now ready for Saturday’s fun paddle, which, I do believe, is another story.